Earlier this week, the Ministry of National Security donated two Mahindra pickup trucks to the Police Department. And today at the B.D.F. 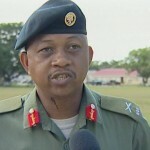 compound at Price Barracks in Ladyville, three were handed over to the force. The vehicles now bring the fleet to ten vehicles. Following the brief ceremony, B.D.F. 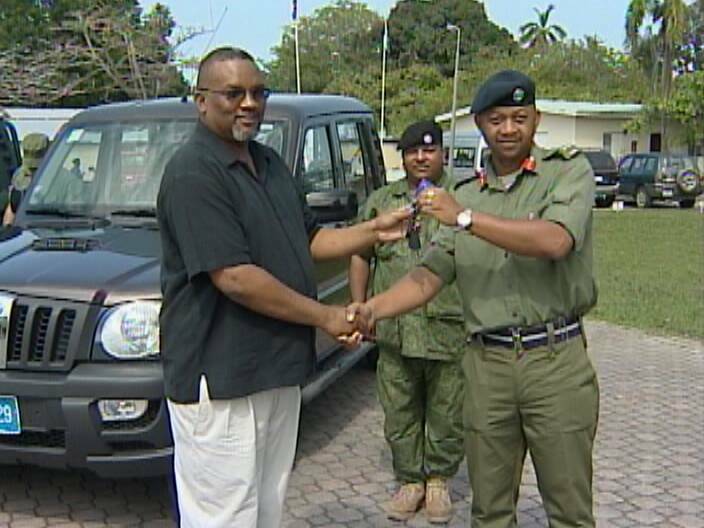 Commander, Brigadier General David Jones told News Five that the vehicles will be used for quick response, reconnaissance and strike operations along the border and in the streets of Belize City. 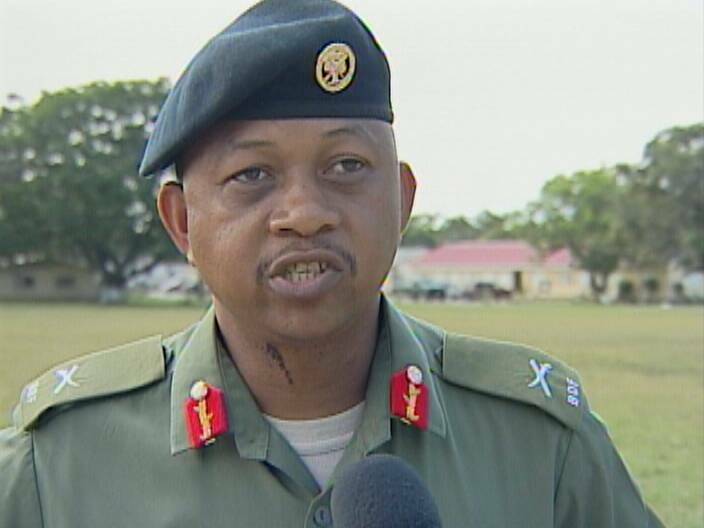 Apart from what the government has gifted to the BDF, Jones says that the force is looking forward to other troop-transport vehicles. Sounds like they might be getting some wrecked autos the GOB has piling up from the authorized employees who don’t have driving licenses. If the cops get lucky they might get some gasoline for patrols. Then again if the vehicles are totaled, BDF or the cops won’t need gas, oil or tires. I don’t like the word ‘donated’. As if there is anything ‘free’ going on. Everybody Wins! ( or so you’d think, right?) The military gets three “troop transport” vehicles, Jon-jon shows his ministry is doing it’s work, and anotehr local company completes the sale of 3 vehicles thereby putting money into the economy! All is well and good! …..those Mahindra vehicles are like “matchbox cars”. a history of being easily damaged and smashed on the regular old paved highways, never mind the dirt road and difficult terrain of PG! Troop Transporter? a likely story! Adding to that, this is another set of vehicles being bought from Penner’s friends (some people allege that they’re relatives) at Caribbean Solutions who are the dealers for mahindra! think that money is coming back out into the economy? check spanish lookout over the last 50+ years. not bloody likely! So while it may seem that jon-jon is doing good work, what he’s really doing is continuing the padding of the pockets of friends and cronies of the UDP, while saddling our military with equipment that will last them a few short weeks in rough terrain! Fool dih talk but fool nuh dih listen! Belmopaneze has a legitimate point. Mahindras have a pretty terrible reputation for durability. I spent some years working in Nicaragua where many were donated to the government there, and their frames were easily bent by potholes, etc. If we really want military transport, I think we would do better to see if the Brits have some used equipment to give or sell us, now that they are downsizing their military forces. We don’t see Mahindras in “first world” armies. Frames of Fords Chevies Dodges Toyotas isuzus will bend too with the STUUUUUUPID drivers bze has…And by the way “BELMOPANEZE”: Is Caribbean Solutions a place you opened? I have never heard of it……..Is it some resort? A palapa of some sort? Or a beauty spa? Darn, get your info right…Also, as a matter of fact, a Mahindra stands more roughing up than any softy D-MAX or hilux..Oh and you know, BELMOPANEZE, Spanish Lookout didnt just all of a sudden become what it is in a day or too. Many people have sweat blood and tears,..you know for what? For you, yes YOU and your family to stay alive…QPP, largest chicken producer, Country Meats, large beef products producer..Country Foods, egg distributor, and your rice beans corn etc ALLLLLLL Comes from SPL…So what say you, should we close SPL for a week? Or 2 maybe? Who would go begging for a bottle of milk then eh? Both Belmopaneze and Bear are obviously misinformed. First off – MOTOR SOLUTIONS is the dealer for the Mahindra. Belmopaneze you have the Caribbean Tire cronies mixed up with the guys from Motor Solutions. Bear your memory of Nicaragua is a bit blurry as you seem to have Mahindra confused with the great wall or other chinese vehicles. I work with a private company who has bought a number of these trucks over the past year and a half and we have never seen anything as durable. I visit my friend in Paraguay from time to time who has a large scale farming and construction operation and he bought 10 Mahindra pickups and 5 Toyota Landcruiser pickups five years back. When I visited in January he told me that 5 years later the only difference they’ve seen between the two is the power difference of the 4 cylinder vs the 6 in the Landcruiser pickup. If you would do a little research (which you obviously haven’t) you’ll find that Mahindra manufactures loads of Military and Defense equipment, like Torpedo Launchers, bullet proof military vehicles, grenade resistant trucks, etc. Mahindra started off by manufacturing the Willy’s Jeep in WWll and these vehicles that GOB is buying are a third generation of that Jeep. Anyways, glad to see we are mobilizing our military and police. Now let’s work on ensuring the vehicles are used for the purpose they are bought, and not to take girls home from high school.